As an entrepreneur, it can be hard to admit defeat. When Facebook Product Manager Josh Williams started working on Gowalla, a location-based social network, his ultimate vision was for “people to see the world through the eyes of their friends,” Williams recently wrote on Medium. Convinced that the idea was crazy, Williams set out to launch it in time for SXSW in 2009. But it turned out that Dennis Crowley and Naveen Selvadurai were working on a very similar project called Foursquare, which launched on the exact same day as Gowalla. But Foursquare had a few things that Gowalla lacked: an entrepreneur with vast experience in location-based projects, a strong New York following from Crowley’s previous social network product called Dodgeball, and a “more accessible and less fussy” product, Williams writes. Shortly after launching, Foursquare raised $1.35 million from a bunch of investors, including Twitter co-founder Jack Dorsey, Union Square Ventures, Digg founder Kevin Rose, and SV Angel. At that point, Foursquare started publicizing the number of people checking in every day, which helped them set the bar for measuring success in the check-ins space, Williams writes. But that didn’t stop Gowalla from moving forward with the launch of new social features, and support for Facebook Connect. The company started to see more growth, and started to catch up to Foursquare in regard to daily check-ins, Williams writes. That’s when investors and a handful of companies wanting to acquire Gowalla started calling, Williams writes. 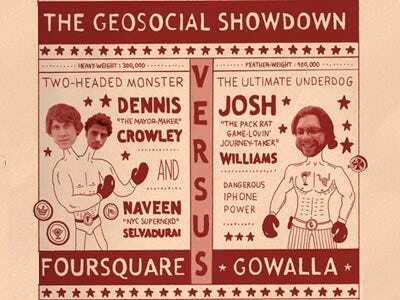 Even though Gowalla did well during SXSW, Foursquare still came out victorious. And a couple of months later, Foursquare raised an additional $20 million, which valued the company at more than $100 million. Gowalla tried to get its numbers up through marketing deals, and expanding to additional mobile platforms like Android and BlackBerry. But it didn’t help, as Foursquare tended to be one step ahead of them in all of those efforts. Facebook eventually acquired Gowalla in December 2011, brought on board members of the Gowalla team, and shut down the platform. But one could argue that Gowalla actually beat Foursquare, in light of a recent PrivCo report saying that Foursquare will fail by the end of the year.